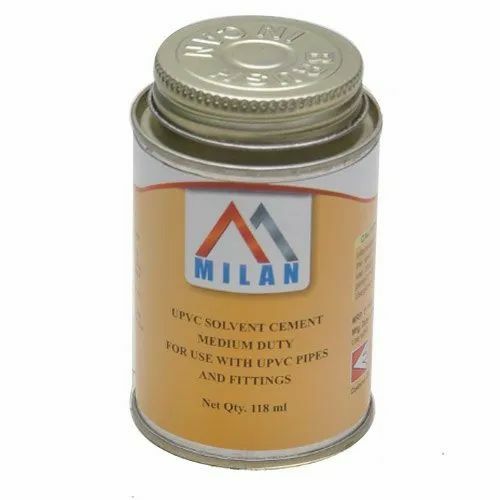 MILAN UPVC Solvent cement Adhesives Medium Duty cement available in Tin and Collapsible Tube Container. High in class. Best in Quality with Good Tensile Strength. For use with UPVC Pipe and fittings upto 5". Suitable and recommended in all grades and all types of UPVC Pipes and Fittings, Electrical conduit Piping,Plumbing and Irrigation Areas, UPVC Joints leakage and also for industrial pipelines. We “Kenon Adhesives Private Limited”, are Pvt Ltd company, based company engaged in Manufacturing of PVC Solvent Cement Adhesive, UPVC Solvent Cement Adhesive, CPVC Solvent Cement Adhesive, etc.